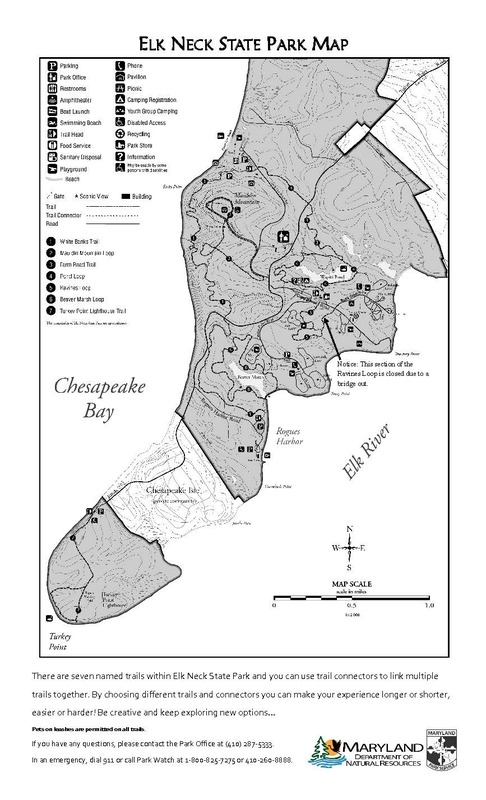 Elk Neck State Park boasts 2,188 acres of sandy beaches, marshlands, and heavily wooded bluffs within the peninsula formed by the North East River, Elk River, and the Chesapeake Bay. A wide variety of plant and animal life thrive throughout the area, which offers many walking trails...including a trail that provides a scenic view of the Elk River and the Chesapeake Bay as it leads to the historic Turkey Point Lighthouse. The park also supports camping and picnicking with picnic shelters and nearly 300 camping units, as well as cabins for rent. Turkey Point Lighthouse is open from sunrise to sunset. If using the boat launch there is a $10 fee for instate vehicles and a $12 fee for out of state vehicles. On weekdays April-October buses pay $10. On weekends buses pay the standard per person charge. November-March buses are $10. Prices for renting cabins or campsites can be found on the Elk Neck State Park website. The park is open year-round for most outdoor activities such as hiking, but some activities such as camping at the park's cabins have their own limited seasons. Elk Neck's campgrounds contain 278 camping units...for tents, trailers, or motor homes...with conveniently located washhouses. There also are nine 4-person cabins to rent during the warm months. Picnic sites are available near the beach area, and larger groups can rent picnic pavilions. There are several locations where the river is accessible to swimmers, including the North East River area. The park also supports fishing and flatwater canoeing in appropriate areas. The Rogues' Harbor Boat Area offers launching ramps. Fishing and hunting is permitted in season at designated areas with the proper permits. Elk Neck State Park offers picnic shelters, campgrounds with electrical hook-ups and washhouses, a camp store, a dump station, a snack bar, a chapel, and a visitor center. The Elk River Camping Area is located on the eastern portion of the peninsula and offers over 250 campsites, 15 cabins (7 mini/camper cabins and 8 rustic cabins), a youth group camping area, park store, playground, and a nature center. Between Easter and mid-November, there is a port-o-pot at the lighthouse. On Saturdays and Sundays (April through November between 10 a.m. and 4 p.m.), you can climb the wooden steps up to the top of the 35 foot tall beacon and learn more about its history from one of the park’s dedicated volunteers. Climbers must be at least 42” tall. The North East Beach Area provides swimming access to the Susquehanna Flats of the Chesapeake Bay. There is also a canoe and kayak hand-launch area, just north of the swim area. Rogues Harbor Boat Launch Facility offers public boating access to the Elk River, and fishing piers. Elk Neck has several new campsites with full hook-ups that are fully accessible, including a sidewalk to an accessible bathhouse. Several sites are available for disabled hunters during shotgun and muzzleloader deer seasons. Pets are prohibited in the cabins and some camping areas. See site for more specific information. In 1608, when Captain John Smith approached the area that is now Elk Neck State Park, he was looking for the Northwest Passage—a water shortcut across North America to the Pacific Ocean and Asia. He was also looking for gold and silver that would help the British compete with their fellow colonial power Spain. The two countries were vying for control of land in the Americas. In the end, Smith found no gold, silver, or Northwest Passage in the Upper Bay. However, he met Massawomeck, Tockwogh and Susquehannock Indians and encountered an ecosystem teeming with oysters, crabs, fish, and other aquatic life. He watched huge flocks of birds pass overhead on the Atlantic Flyway migration route, and he saw vast stands of aquatic vegetation waving beneath the water’s surface.